Scott Brechmacher assessed lighting retrofits at 18 of Wakefern's most energy-intensive stores. Scott Brechmacher helped Wakefern Food Corp., a cooperative grocery distributor based in New Jersey, progress toward organization-wide sustainability goals set in 2008. The goals, which Wakefern aims to reach by 2015, cover energy consumption, water use and waste generation at 287 ShopRite and PriceRite grocery stores across 6 states. Brechmacher focused on energy consumption, assessing 18 of Wakefern's most energy-intensive ShopRite stores for potential energy efficiency upgrades. 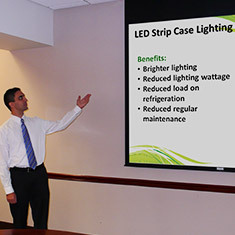 Ultimately he recommended lighting retrofits, occupancy sensors and upgrading refrigerated cases with light-emitting diode (LED) lights, night curtains, or both. Across all 18 stores, these projects could reduce energy consumption by over 3.8 million kilowatt hours per year, generating annual savings of over $530,000 and 2,600 metric tons of carbon dioxide. Over their lifetimes, the projects could save Wakefern nearly $2.7 million. Scott Brechmacher, a student at Indiana University, was hired as the 2012 EDF Climate Corps fellow at Wakefern Food Corp.